Place the olive oil, grape seed oil, lemon zest, thyme and 8 Ceylon Green Tea bags in a saucepan, over the lowest heat possible. Using a candy thermometer bring the infused oil to 50°C. Strain oil and place ocean trout in oil for 8 minutes. Meanwhile, bring the spring water to the boil in a small saucepan. Infuse 2 Ceylon green tea bags for 3 minutes and then strain. Heat 2 tablespoons of the infused oil in a frying pan over medium-high heat. Cook the bugs for 1-2 minutes each side until almost cooked through. Set aside. Mix olives, tomatoes, basil and parsley and spoon onto 6 plates. 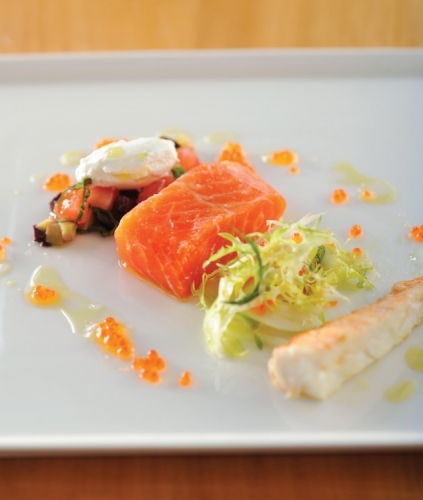 Arrange ocean trout and bug meat onto plates and garnish with goat’s curd, ocean trout roe, shaved fennel and frisée. In a small bowl, mix spring water infusion, lemon juice and 100ml olive oil and grape seed oil mixture. Drizzle over ocean trout, bug meat, fennel and frisée.